A week before Indonesia’s president Susilo Bambang Yudhoyono’s visit to the UK, Parliamentarians, Peers and civil society organisations gathered at the Houses of Parliament, to discuss West Papua’s right to self-determination, freedom from violence and persecution, and actions to be taken to bring this to the attention of the international community. 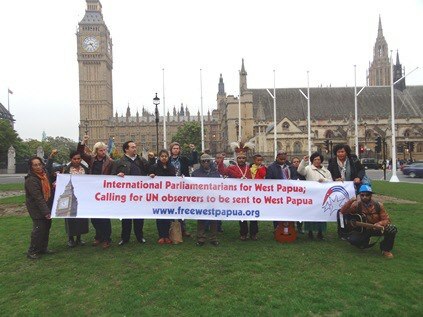 This year also marks the fourth anniversary of the launch of the International Parliamentarians for West Papua. Since its inception, the organisation has grown to almost 100 parliamentarians from around the world. MPs and Peers present were Andrew Smith MP (Chair), Lord Richard Harries and Dan Rogerson MP with many apologies sent from International MPs and specific apologies from UK MPs and Peers, Caroline Lucas, Diane Abbott and Lord Kilclooney. Statements were delivered from Senator Richard Di Natale (Australian Greens Senator) and Catherine Delahunty MP (New Zealand Green Party). Joining them was West Papua’s exiled independence leader, Benny Wenda, representatives from the Free West Papua Camaign (FWPC), Charles Foster of International Lawyers for West Papua (ILWP) and many other interested observers, including representatives from the Netherlands and UK based NGOs. As was discussed, the priority of the IPWP is to press for a United Nations review of the Act of Free Choice (AoFC). Charles Foster (ILWP) reiterated that the Act of Free Choice did not represent a true act of self determination under international law. There already exist well researched documents to this end and the Oxford Lawyers without Borders is continuing to carry out research on this. It was agreed that IPWP will write a letter to the United Nations Secretary General requesting the United Nation’s position on the Act of Free Choice, presenting the legal argument and calling for a review. The MPs and Peers present recognised the urgent need for a United Nations delegation to West Papua and pledged to write to the United Nations Secretary General, calling for United Nations observers to be sent to West Papua, as is repeatedly requested by Papuan civil society groups such as the West Papua National Committee (KNPB). It was discussed that United States Senators have previously visited West Papua, and IPWP members in the UK will request a parliamentary delegation to visit West Papua and encourage their colleagues from all the represented countries to do the same. With the upcoming state visit of the Indonesian President to the UK (31st Oct – 2 Nov 2012) journalists will be briefed and MPs will put questions to the UK Prime Minister at question time. They will also brief him and the Foreign and Commonwealth Office with questions that need raising with the Indonesian President, in regards to the need for an independent investigation into the killing of the KNPB leader Mako Tabuni, the lack of access for media and NGOs in West Papua, Filep Karma’s 15 year jail sentence for raising a Flag, the President’s responsibility for the human rights violations in West Papua, and the suffering to the Peoples of West Papua through natural resource extraction. IPWP Members in the UK will ask parliamentary and FCO questions on the UK Government’s involvement with the Indonesian Police Anti Terrorism Unit, based in West Papua, Detachment 88. This is in response to confirmation that alongside US and Austrailian funding, the UK has provided £400,000 to Jakarta Centre for Law Enforcement Cooperation (JCLEC) since 2005. Funds from this go directly to the training of Detachment 88 which has been accused of human rights violations in West Papua against independence activists. Amnesty International members have highlighted the military impunity and human rights situation in West Papua in letters to their MPs, successfully encouraging them to sign the declaration and join IPWP. New IPWP members are always welcomed.